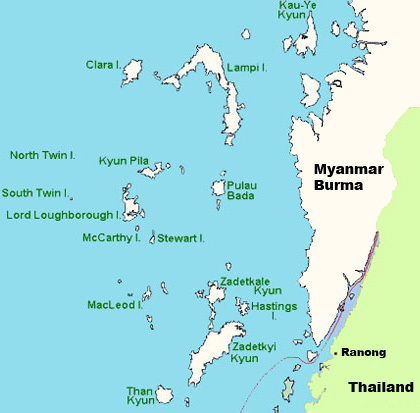 The Mergui Archipelago is in the far South of Myanmar (Burma) and is part of the Tanintharyi Region. It consists of more than 800 islands, varying in size from very small to hundreds of square kilometers, all lying in the Andaman Sea off the western shore of the Malay Peninsula near its landward (Northern) end where it joins the rest of Indochina. Occasionally the islands are referred to as the Pashu Islands because the Malay inhabitants are locally called Pashu. Geologically the islands are characterized mainly by limestone and granite. They are generally covered with thick tropical growth, including rainforest, and their shorelines are punctuated by beaches, rocky headlands, and in some places, mangrove swamps. Offshore are extensive coral reefs. The archipelago's virtual isolation from most of mankind's influence on the natural environment has given the islands and the surrounding waters of the Andaman Sea a great diversity of flora and fauna, contributing to the region's growing popularity as a diving destination. 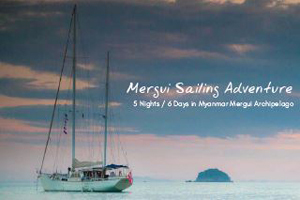 From October until May we are offering Cabin Charters on one of our Sailiing Yachts based in the Mergui Archipelago - Myanmar - Burma. 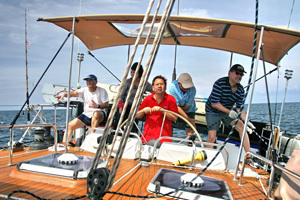 You have also the choice of chartering a Private Sailing Yacht to cruise the Mergui Archipelago. Many yachts at different size and budgets are available. Fully crewded - no sailing experience needed.